In this blog, we will see how to get the default path of data and log files using "SERVERPROPERTY". Get the default path of data files using "SERVERPROPERTY". Use INSTANCEDEFAULTDATAPATH property to get the default path of the data files. Get the default path of LOG files using "SERVERPROPERTY". 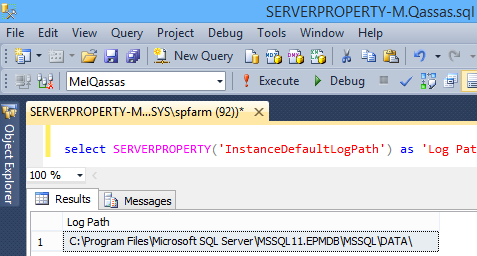 Use INSTANCEDEFAULTLOGPATH property to get the default path of log files. Get the default path of data and log files using PowerShell?